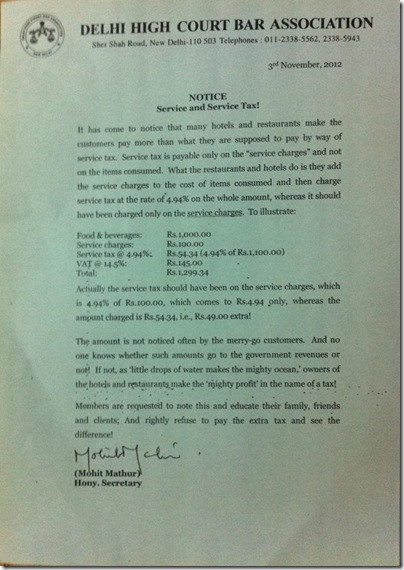 Stripped Law: Service Tax in Restaurants - What the law really says! 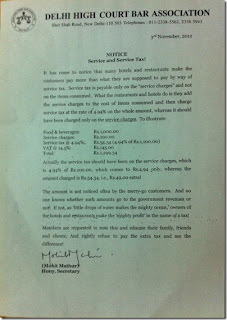 Service Tax in Restaurants - What the law really says! On Saturday, November 3, 2012, The Delhi High Court Bar Association published a notice titled “Service and Service Tax!” (shown above in the image). The notice contained averments claiming that restaurants in India were incorrectly charging 4.94% service tax on the total bill of a customer and that service tax payable at a restaurant is only payable on the ‘service charge’ component of the Bill. The contents of the notice were also spread among lawyers and law students across the country via Facebook and tax law related websites such as CAClubIndia etc. This news spread like wildfire and became very popular online since the averments indicated overt defraudment of the public and many people resorted to expressing their resentment about the same on social media sites, under the impression that the contents of the notice were based on the correct position of law. At the outset, I’d like to make it clear that the notice has been made based on an incorrect interpretation of the Service Tax (Determination of Value) Rules, 2006 and that this would be evident if one merely looked at the relevant provision in the rules. Let me try to explain the correct position of law as simply as possible. (ii) the value added tax or sales tax, if any, levied thereon:"
What this means is that service tax as prescribed by the rules is chargeable at normal rates i.e. 12.36 %. This rate is applicable to only 40% of the total bill amount, since the rest falls under the abatement mentioned above. Since 12.36 multiplied by 0.4 is 4.94%, this is the percentage of tax that is to paid on the TOTAL bill amount (since Explanation 1 says that 'total amount' means gross amount charged in or in relation to the supply of food etc.). There is no involvement of a ‘service charge’ component here since the abatement of 60% means that 40% is considered as the implicit service charge for taxation purposes. Thus, it is quite evident that the service tax of 4.94% is to be calculated on the Total Bill Amount and not merely the ‘service charge’ component of the Bill, as claimed by the Notice. First of all, I think it is highly irresponsible that a well respected body such as the Delhi High Court Bar Association would release such a notice without backing the same with the requisite amount of research. Owing to the source from which the notice was released, most lawyers and law students did not bother to check the veracity of the claims since they assumed that the authors of the notice would know their law. I think they should rectify the harm done by issuing a press release accepting that what was stated in the notice was incorrect in law. Secondly, what this whole debacle illustrates is the lack of knowledge on service tax among the legal community. The general conception among law students that tax law is greek and latin does not help this cause either. So, in simple terms, everyone just assumed that since it’s called ‘service tax’, it is paid only on the ‘service charge’, which seems very logical. I think this should be a sort of wake up call to all interested students/general practitioners who believed this story and they should seriously consider brushing up more on their tax law knowledge. Owing to the growing rate of Facebook hoaxes, as aptly underlined by the whole ‘Samsung paid Apple in pennies’ incident, as lawyers/law students, I feel it is our duty and moral responsibility to do research and to verify ANY claim based on ANY law ourselves before sharing it on a social media site. The ignominy that this incident has attached to it is as shameful as a doctor prescribing incorrect medicine for a fairly obvious disease. We are supposed to know the law, and even if we don’t know it yet, we absolutely MUST find out what the law is before giving advice to the public because that is what our law schools, internships and careers are supposed to teach us – how to do legal research! Today, people are more interested in taking dinner and lunch in restaurants. For those people above article is too useful. Restaurant Service has been defined in a section 65. Restaurant must need a license to serve alcoholic beverage under the service tax. Excellent article, I've been trying to educate people as well when I see them posting incorrect info on this topic on FB, etc. I wrote a post on my blog on this, then found yours, and you've done a great job of explaining the same. Thanks. Planning a fine dining experience with your family or friends? Want to celebrate your birthday or wedding anniversary in a unique way? Indulge into the exquisiteness and sophistication of a posh restaurants, and enhance the joy and happiness of the occasion. It was a very interesting article. But I have a question for you. Why is that we have a uniform tax slab for all the customers visiting restaurants? Because there are many people who place take away orders and there are others who prefer to dine at the restaurant. It just took five minutes for me to stand at the counter and take my order. But I had to pay a service tax which was equivalent to those who were dining at the same place. Some of those dinging there might have placed an order whose value is equivalent to my take away order. But both of us paying the same amount of service tax seems unreasonable. I think there should be different service tax rates for take away customers and those who are dining at the restaurant. Restaurants business has been growing lately. Some people thing it's not a good business to start. I would disagree since for some reason. It's easy to apply for this business' registration, and a lot seeks for this service. We start Catering Service in Delhi, India and its growing up day by day. Its very gud information about restaurant. Here i wrote for Best Restaurant Deals in your area. This is really very important information as most of the people don't know about it. Thanks a lot for sharing such a good source with all; I appreciate your efforts taken for the same. I found this worth sharing and must share this with all. I have read your informative information and like it. This is very helpful for those person that looking for such type of information.. Unless specified to the contrary, the contents of this blog and these pages are protected by copyright and no part of them may be reproduced in any form or used in any other way except with the Blog Administrator's prior written permission or in accordance with the next term set out below. You may print off or download the visible text on the site for personal non-commercial purposes but it may not be used for any other purpose. Scholarship Announcement for Stockholm Arbitration LL.M. Law Firms and Advertisements: Wake up please, Bar Council of India!